This is a very easy and quick hat. Use super bulky weight yarn of at least 76 yards per 100 grams. Chelsea Yarns, Hubcity Fibers and Asylum Fibers. When you are ready to do the decrease rounds, make sure that you have at least 4-5 yards left. The decreases go very quickly since you will be doing k3tog. This hat is plain without a pompom. 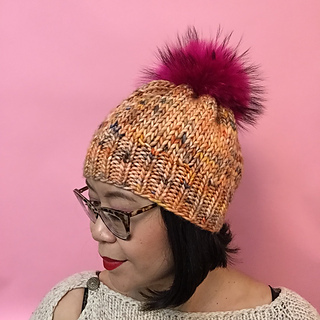 Put a Pom on it to give it some sassiness! 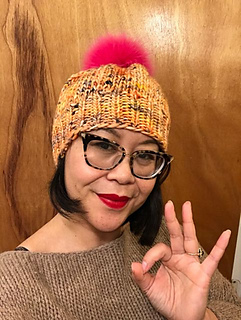 I was able to make one hat in a day.